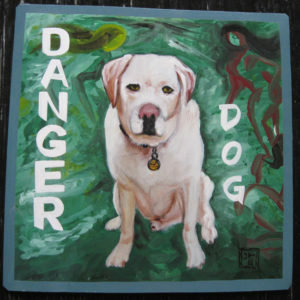 This charming portrait of the handsome Duke is hand painted on metal. 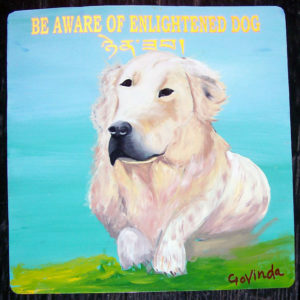 This portrait of Ruby includes Tibetan script. 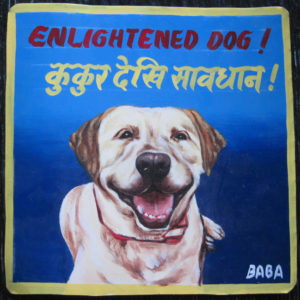 Govinda uses reflective tape for his lettering, so this writing glows under headlights (and flashbulbs). 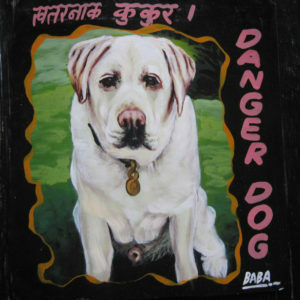 This portrait of Ruby the white lab was hand painted on metal by Jit Gurung. 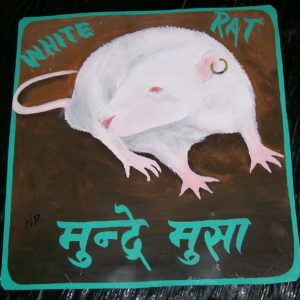 Megh Raj Thapa did a great job painting Hester’s portrait on metal. 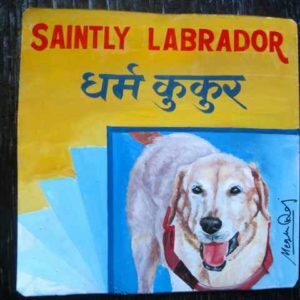 This pretty Labrador Retreiver is a saintly dog. This handsome white lab is named Gus. Here he stands in a field of green, waiting for a ball, no doubt. 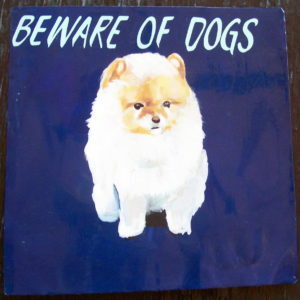 I did not commission this portrait. 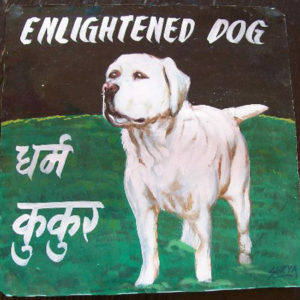 The white Labrador is a Nepali dog and the image used was from the Everest Kennel Club calendar. Barney is a handsome and happy white lab. 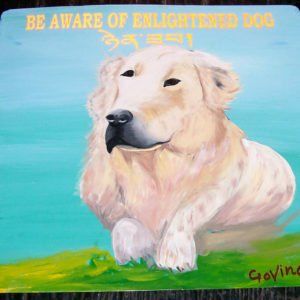 This laid back Zen white Labrador Retriever is hand painted by Nara of Asha Arts. 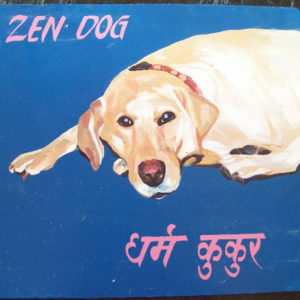 The Nepali script translates as Dharma Kukur (religious dog). 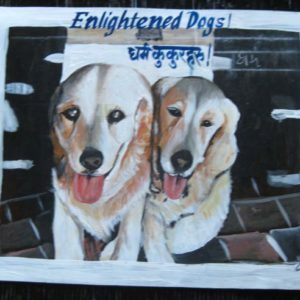 Sam and Wilbut again, this time hand painted on metal by Sanjib Rana. 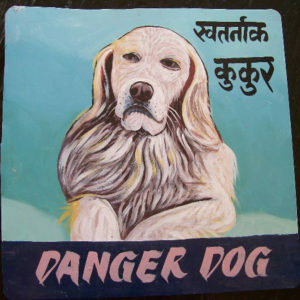 Sanjib uses acrylic paint, so this sign is not meant for outside display. 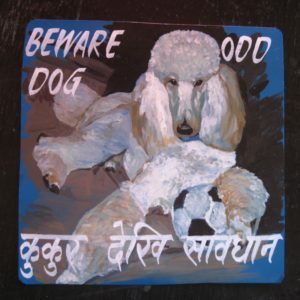 Bowie the White Standard Poodle hand painted on metal by Nara. 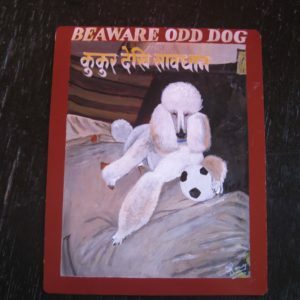 Bowie the White Standard Poodle holds her favorite soccer ball in her portrait by Sagar Bitsa. 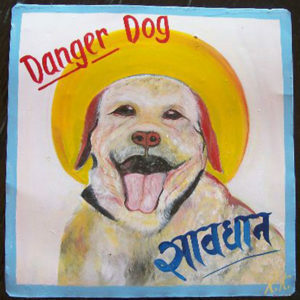 Sanjib Rana, a fine artist from Kathmandu, hand painted this portrait of Bowie on metal using acrylic paint. 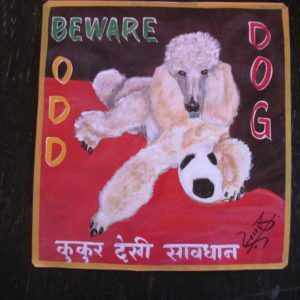 The size of this painting is 12″x15″ rather than the standard 12″x12″.